Podcast #003 – We Saw Iron Man! We had a larger cast than usual as we discuss our limited knowledge of Iron Man, the sneak preview, various other movies, LifeLock (identity insurance), The Amazing Adventures of Kavalier & Clay, our final impressions of the movie, and try to answer the burning question: How many costumes has Iron Man worn? Notes: The podcast also features some musical clips from “Iron Man” by Black Sabath, and what I believe to be a band called Giant Sand covering said classic track. (The latter via Cover Freak.) This is our first real editing job here at Read Comics, so we hope you enjoy it. The speaking portions of this comic were recorded on Marty’s iPhone, which was a gift from his lovely wife and fellow podcaster, Florence. Also, big thanks to everyone we interviewed (badly) in line for the movie. If you’re reading this, leave a comment, cause you were awesome! This entry was posted by Martin	on Wednesday, April 30th, 2008 at 1:04 am and is filed under adaptations, Marvel, movies, podcasts. You can follow any responses to this entry through the RSS 2.0 feed. You can leave a response, or trackback from your own site. While I can’t seem to find a definitive answer to the question, there are approximately 66 different iron man suits listed on wikipedia. UPDATE: Spoilers in the comments below. Read on at your own risk! Hi Nick! Thanks for commenting. 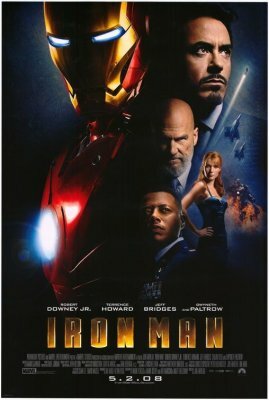 I still think they might have an “out” where either a) the public doesn’t believe he’s actually Iron Man, or b) the second movie starts off with the last scene of this movie, and the audience laughing along with his little “joke” at the podium. I wish I’d name-checked the guy who had the briefcase. Does anyone remember his name? Think of it…Tony Stark has to build War Machine armor for Rhodes in order to team up and take on Titanium Man and Crimson Dynamo (who are being controlled by a hard-line Soviet faction in Russia hell-bent on bringing back the glory days of the USSR!). Since Fantastic Four bastardized Dr. Doom (who has NO superpowers in the comics – unlike the movie), I think TM & CD would be the next best adversaries for IM & WM. Heh. Thanks for the speculation Nick. Not having read a ton of Iron Man myself, I can’t really agree or disagree. I wouldn’t have put it past them to try and capitalize on current events in the Marvel universe… but they probably had to tell the origin story first. Wouldn’t it be cool to have had the movie tie in with the comics that are coming out now? Maybe next year we’ll get a skrull invasion movie. Jason just discovered that there is something after the end credits of the movie that was not in our preview screening. Fortunately, I was able to find Samuel Jackson’s cameo on youtube. I can’t decide whether this makes me want to go see it again more or less than before. More because I would really like to see the full movie as intended rather than a screener, but less because this was apparently the director’s decision, to screw over all the people who saw preview screenings by not giving them the full experience. Although, I’m still disappointed with whoever arranged the screening we saw Tuesday night since there was NO ONE from Marvel/Paramount/etc. asking viewers about the movie afterwards. I waited around and looked for people…but no one official that I could find. Did anyone else find someone official to give their opinions to? If you search for it long enough, you can probably still find it. Also, in response to the other stuff in your comment (which I clearly read, but didn’t have anything to say about until just this moment), there are basically two reasons for those screenings, one is for feedback about the movie, and the other is to promote the movie. Generally a screening is one or the other, not both, and that has more to do with timing than anything else. A movie that comes out in less than a week is not going to get changed before you see its official release the following week. (Except in rare cases like this one, where the someone decides to make and show two different versions.) Generally, if the studio is actually looking for real feedback on a movie, the screening will be months (or at least weeks) before its release. I was wondering if our screening was only promotional in nature… I also noticed that we were watching an analog film – not digital projection. I’m guessing they released the screener in analog format because it’s harder to copy than a digital form (right-click “copy to”? ), but I also have faith in UPS/FedEx being able to overnight the digital projection format copies to any theater in the US with whatever ending that Paramount/Marvel decides is best. In this digital age, you can make changes right up until showtime (cough*GeorgeLucas*cough). Anyways, the plan for today is to go see it again…on a DLP monster screen! So we actually returned to the theater and paid to see the movie again with our friend Mike, who was not at the preview screening. The place was packed, and we had to squeeze into the front row, so I’m guessing that it is successful with more than just fans. I enjoyed Mike’s first-time reactions, but I have to admit that I didn’t get much out of seeing it a second time. As much as I enjoyed the movie, I didn’t discover new layers or hidden details, and I lost the element of delight and surprise in many of my favorite scenes. Perhaps if I was a bigger fan of the comics I would have caught more of the embedded detail. To get back to my reason for posting, I don’t think that the wide release was in digital format after all, because we saw big green lines tracking through one of the reels. Digital vs. Analog projection is completely dependent upon the theater you’re viewing the movie in. I saw it a second time over the weekend at Wynnsong 15 in Moundsview and they are showing it in Digital Projection because all of their screens are equipped with Digital Projectors. This is not universal though – for example, last time I checked, both AMC Maple Grove and AMC Eden Prairie only had ONE digital projector each – out of their 16-18 screens! Some theater chains (Carmike) are cutting edge with digital projectors and some (Regal) are still analog. Usually the movie listings either online or in the paper will note when a movie is digital projection with a “(DP)” or separate showtime listings. Well okay, then. I’ll keep an eye out for the code next time.